It's true: Slayer is a musical force of nature. People who dismiss them as “a metal band” are missing the point of a musical power that is daunting when witnessed in person. Precision and talent, craft and endurance: these are hallmarks that characterize the music of Slayer, raising them to a singular level. You can be forgiven for watching recent video interviews with the voice of Slayer, bassist Tom Araya, and coming to a surprising conclusion: “He seems like a really nice guy.” But the black soul of Slayer is guitarist Kerry King: scowling, wrapped in chains with spikes protruding from his imposing build, shaved head pitched with broad swathes of black tattoo ink. King lords over the stage of Slayer with each performance, plugged in to the aural overload, rarely pausing to survey the chaos playing out in the pit at his feet. He is consumed by a singular purpose – to ensure that Slayer is never anything less than a precise, frightening, and stunning sonic maelstrom. Kerry King surveys Slayer mayhem, 2009. Even members of Slayer get phone calls at awkward times. 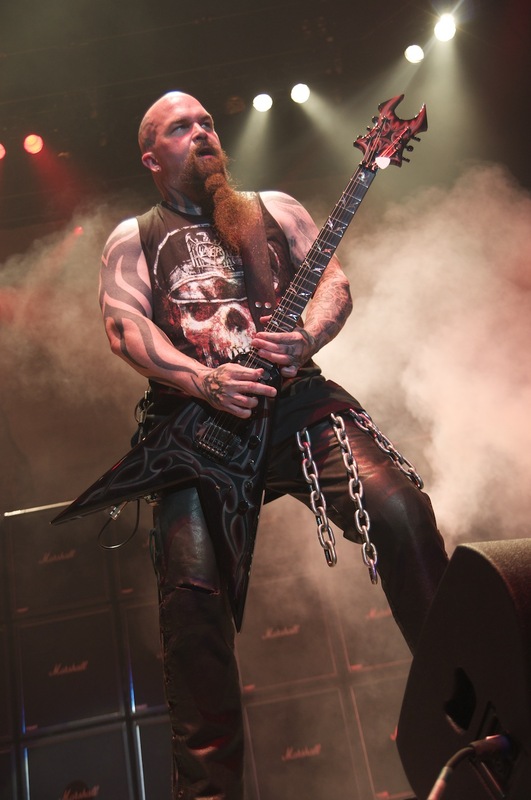 When Kerry King, guitarist for the mightiest of metal bands, is phoned and asked how he’s doing on the morning of Slayer’s 1998 American tour kickoff, King replies that his head still bears shaving cream from a pre-tour shaving touch-up. But King is not one to let grooming get in the way of talking about Diabolus In Musica (American Recordings), Slayer’s latest testimony to the power and glory of unrelenting heavy metal. From the opening seconds of the dramatic “Bitter Peace,” it’s clear that Slayer’s latest not only retains the fury characteristic of the band’s catalog but also introduces a new element of sophistication in the song construction and performances. Slayer sophisticated? Those who dismiss the band’s music as Neanderthal pounding might be surprised at what they’d discover if they actually listened to Slayer. 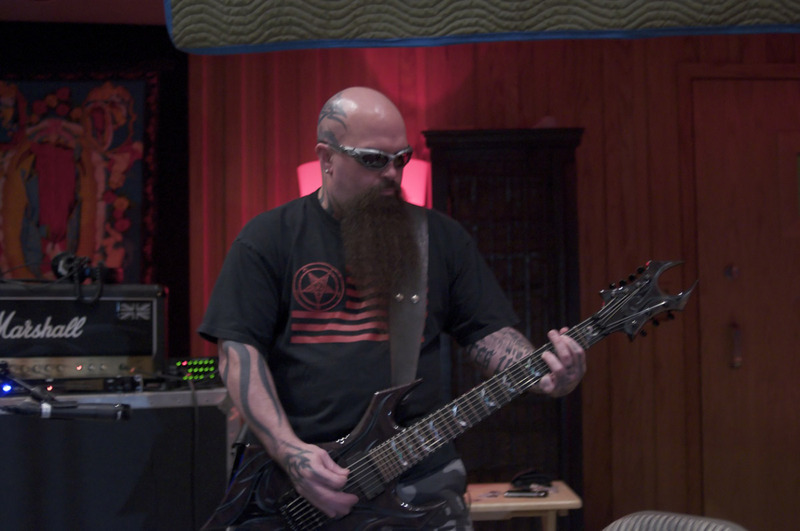 The process of recording a Slayer opus comes after months of intense rehearsal. By the time the band occupies the recording studio, the battle plans are well laid out. Kerry King in the studio. Many of Slayer's most harmonically-complex compositions are the work of King. With Diabolus in Musica safely recorded and in the stores, King is anxious to hit the road. Intricate riffs – hurtling back and forth between King and co-guitarist Jeff Hanneman – are a hallmark of the Slayer live sound. Launching these complex communiqués over the rumbling foundation built by bassist Tom Araya and drummer Paul Bostaph requires intensity and concentration. Aside from the musical merits of Slayer, the aura that surrounds the band has spooked parents since their inception “at the dawn of time,” as King jokes. Though Diabolus in Musica song titles like “Death’s Head” and “Perversions of Pain” betray no softening of Slayer’s attitude, new competition has arrived. Now acts like Marilyn Manson occupy the nightmares of parents who seem to have forgotten that Alice Cooper played the same shtick two decades before. One of the first bands to rouse parental ire was Black Sabbath, and Slayer has joined the lineup of Sabbath vocalist Ozzy Osbourne’s hugely successful Ozzfest. 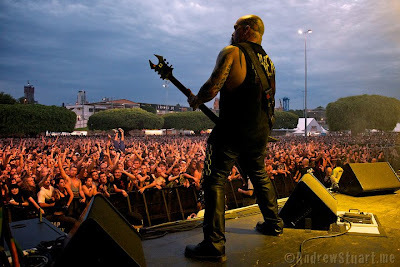 King feels that Ozzfest’s congregation of hard music fans creates new opportunities for his band to present their music – especially for people who might find a typical Slayer gig a bit too intimidating. Kerry King, bringing the Australian masses around to Slayer's way of thinking, February, 2011. 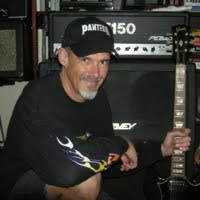 King feels that bringing new fans under Slayer’s influence through high-profile shows like Ozzfest would be a positive development. Regardless of whether the ranks of Slayer followers swell in the years to come, for King the sonic impact of his band remains his primary focus. And though Diabolus in Musica offers further proof that Slayer is one of the most inventive of metal bands, King feels that there are greater discoveries ahead for his band.